Christophe Berra will put the Scottish core back into Hearts if he returns to Tynecastle. That was the message today from the club’s former winger Andy Driver, who insisted Berra is just what is needed at Tynecastle right now. The 32-year-old secured his release from Ipswich Town yesterday to return to his native Edinburgh and be nearer his four-year-old daughter. 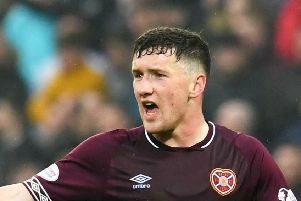 Hearts are now favourites to re-sign him but face competition from other clubs. After six wins in 24 games since December, plus some sub-standard January signings, supporters are disgruntled in Gorgie. Driver explained why Berra would make the ideal summer recruit for his old team. “Hearts haven’t done so well over the last six months. You can’t blame foreign imports but without a good Scottish base it’s probably harder,” he told the Evening News from his home in the Netherlands. “Christophe would bring that back. He knows Hearts and did really well for the club when he was there, plus he’s obviously a really good player. You’re getting a good Scottish guy but, more importantly, you’d be getting a top player. Berra captained the Edinburgh club whilst Driver was there before a £2.3million transfer to Wolverhampton Wanderers in 2009. He then joined Ipswich in 2013 and currently holds 35 Scotland caps. He also has the required character to lead a dressing-room, something Driver noted ten years ago during a training session at Riccarton. “I remember him getting into a scuffle in training once with Larry Kingston,” revealed the De Graafschap man. “Even though he is a nice guy, it does mean something to him. It’s not that he’s that type of person but he did get into that situation once. That showed me he’s got that edge to him. “Christophe is a nice guy but he’s definitely got that will to win. He shows that. He puts his head in where it hurts and he’s probably got a few scars over the years to show for it. You know what you get from him. He’s not overly emotional but when the game gets going, he gets into it.